Karwa Chauth is a ritual of fasting observed by married Hindu women seeking the longevity, well-being, and prosperity of their husbands. It is popular amongst married women in the northern and western parts of India, especially, Haryana, Punjab, Rajasthan, Uttar Pradesh, and Gujarat. The term "Chauth" means the "fourth day: and "Karwa" is an earthen pot with a spout--a symbol of peace and prosperity--that is necessary for the rituals. Hence the name 'Karwa Chauth'. This festival comes nine days before Diwali on Kartik ki Chauth--on the fourth day of the new moon immediately after Dusshera, in the Hindu month of Karthik (October-November). 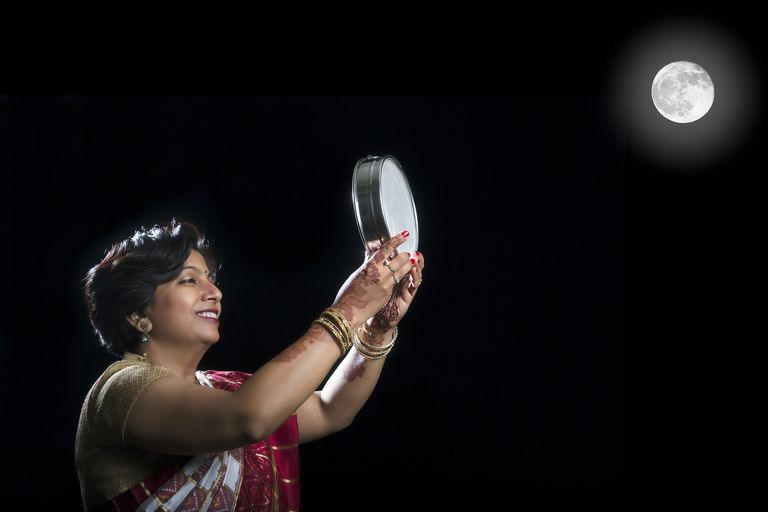 Karwa Chauth is the most important and difficult fast observed by married Hindu women only--unmarried women, widows, and spinsters are barred from observing this fast. The fast begins before sunrise and ends only after offering prayers and worshiping the moon at night. No food or water can be taken after sunrise. Married women keep a very strict fast and do not take even a drop of water. They get up early in the morning, perform their ablutions, and wear new and festive raiment. 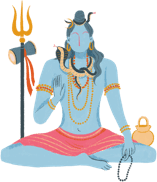 Shiva, Parvati and their son Kartikeya are worshiped on this day, along with the ten 'karwas' (earthen pots) filled with sweets. The Karwas are given to daughters and sisters along with gifts. In traditional observances, the fasting woman does no housework for the day. Instead, women pass the day by meeting friends and relatives. In the evening, a ceremony that includes only women is held. In the evening, women dress up in special clothes, usually a red or pink sari (lehenga-choli) with gold woven 'zari' patterns. These are considered auspicious colors. New brides often wear their bridal costumes, and they are fully decked out in jewelry and wear 'Mehendi' or henna patterns, especially on the hands. Decorative bindis on the forehead are a must for all women taking part in this celebration. Fasting women from all over the neighborhood gather in a group and narrate mythological stories that underscore the significance of Karwa Chauth. And, of course, all wives expect lavish gifts from their husbands! The fast is broken once the moon is sighted and rituals of the day have been performed. At night when the moon appears, women break their fast after offering water to the moon. The fast of Karwa Chauth truly sets the merry tone of the fun and frolic, festivity, and feasting that come in good measure during Diwali--the biggest festival of the Hindus. When Is Krishna Janmashtami in Upcoming Years?